Once you’ve sorted out your new engine, exhaust and wheels, you might notice that things have started heating up. The humble radiator may not be the most glamorous parts of your car, but it’s importance cannot be overstated. If you haven’t got a radiator to match the rest of your car then things can quickly start to go very wrong, very quickly. Tarmac Sportz would like to introduce you to Koyorad, a company who’ve been dealing with radiators since 1956. Over 60 years of experience, and it really shows in the build-quality, effectiveness and innovation of their radiators. They offer several different series of radiators, which each have their own strengths, for a variety of cars. The HH Series is designed with an ultra high fin density to maximise heat transfer. On top of that, Koyorad know that you won’t just stop with the HH Series radiator when modifying your car, it also comes with female accessory fittings as standard, so it’ll accept temperature sensors typically associated with aftermarket temperature gauges. The R-Series is built to go in proper performance cars - with a 53mm core it offers increased capacity so your engine will have a better chance of cooling down when you really need it. The S-Series is a less expensive category of radiator, which uses plastic and copper instead of aluminium, but these radiators still offer great heat dissipation and are perfect for lightly tuned cars. V-Series are designed for cars which have less space for the thicker core radiators, at only 36mm, these should fit with no issues. For cars which don’t have a lot of space and require the absolute best in performance, Koyorad built the the Hyper V-Series. The fins are arranged in a way that provides maximum surface area to allow heat to radiate effectively and also let air circulate properly. Tarmac Sportz will only ever sell you parts that are built to the highest standard of quality, reliability and safety. That’s why we were so pleased to learn that Koyorad doesn’t outsource the production of their radiators. They use several privately owned factories to make sure that all of their quality control methods are carried out. They begin with top grade materials like copper, aluminum, brass and high-resistance plastics - all tested to withstand the harsh outside elements, but also years of being under the hood. Each aluminium radiator core is hand assembled, brazed using Nocolok flux tech and then TIG welded by hand. They believe in quality over quantity and it really shows when you take a look at one of their radiators, they really are solidly put together. 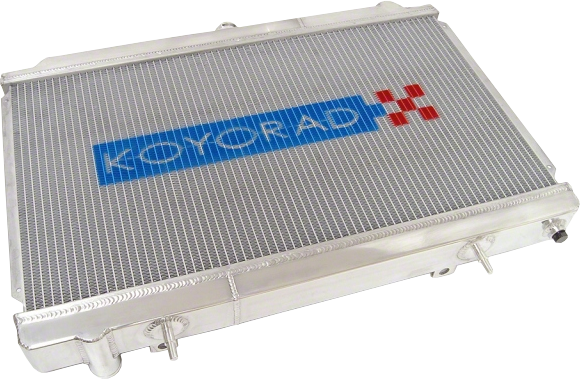 Koyorad make it so easy to install one of their radiators in your car. They manufacture them to to have precisely the same dimensions as the Original Equipment Manufacturer’s radiators for the particular model of car, so no further modification is required - it’ll just slot right in where the original one was. We like it when manufacturers make car modding easy.